Gay journo Michael Lavers, national news editor for Edge Media Network, took to discussing the state of LGBT print media in the Village Voice‘s annual “Queer Issue” this week. 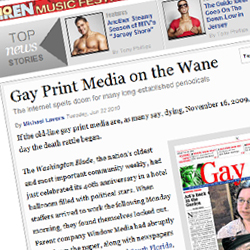 His piece, titled “Gay Print Media on the Wane,” rehashes the demise of Window Media — once the nation’s largest LGBT newspaper company — and delves into the possible future of gay journalism. In the story, Lavers writes that the rise of digital media has given traditional print media a run for its money. No doubt there. He also details some specific challenges to gay media and proclaims some new “kings of the forest” (he calls them the “new gay press establishment”) in the process.